Mark Baughman moves seamlessly from alt rock to metal to acoustic ballads to tell complex stories about complex lives. Mark Baughman writes songs that matter about people and things that are real. He tells his stories as much through his expressive guitar work as he does through his tight, sophisticated lyrics. He's not afraid to use established genres to help set the scenes but he always brings a unique perspective that makes his songs accessible yet fresh. 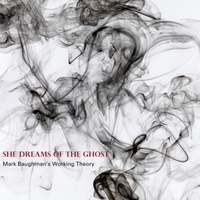 In this latest album, She Dreams of the Ghost, Baughman dives deep to explore people and relationships and how the years can make the simplest emotions complicated. Starting with the rock song Nothing is Written, Baughman starts to blend in Gospel influences, which expand in the following track Liar's Poker. The title track tells the painful story of a love affair that could not be and Too Old to Cry is a simple and beautiful ballad about courage. Energie is a triumphant song about standing one's ground while Barbed Wire Coat is a plea that manages to stay upbeat and hopeful. The album turns more metal as it addresses the darker realities of life culminating in Tipping Point, about a woman who has survived childhood sexual and then later spousal abuse. The final song is a gift to Baughman's brother who is an accomplished physician and in his own way equally poetic and intellectual.